We spoke recently about the new MS Series of screens which Asus have just launched. These new models offer an attractive and unique design as well as some decent specs. Their press release states: "Graceful design combines with leading quality components and ASUS Splendid™ Video Intelligence Technology to deliver crisp fast visuals in Full HD 1080p, 50,000:1 contrast ratio, 2ms response time and an extra 40% in power savings. The unique spherical ring stand features Ergo-Fit Technology that lets the user adjust the monitor’s tilt angle with just one gentle nudge of a finger. The Designo MS Series’ ergonomic design puts the screen at eye level for a comfortable and productive dual screen computing experience when deployed as a notebook’s supplementary monitor." The design of the screen is certainly very unique. The whole monitor is very very thin at only 16.5mm and is basically just one big panel finished in a very nice glossy piano black front and bezel, and with a glossy pearl white back. There is no stand as such, just a simple black ring which is easily screwed on to the back of the screen. This provides a very simple and easy to use tilt function although the actual tilt range is very minimal. The screen sits on your desk and so the actual viewable area is very low down compared with most other monitors. There's also no height adjustment which makes the ergonomics of this screen pretty limited, but then if you're buying it you will surely be prepared for the lack of adjustments anyway and know what you're getting. I actually quite liked the design of this stand and it looked very sleek sat on the desk. The glossy finish was not too shiny either thankfully. 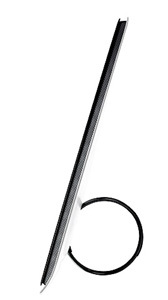 Being a super slim design, the screen is very light, and so the ring stand can support it well. It also makes the screen very easy to move and transport should you need to. Materials and build quality feel of a high standard and the screen is certainly an attractive design. The panel itself features a matte AR coating finish as opposed to any glossy solution. During operation the screen remains pretty cool and does not give off much heat at all. It also makes no noticeable noise or buzzing. The MS Series eco-friendly design reduces power consumption by 40% and is manufactured with 50% less hazardous materials according to Asus. At the bottom right hand edge of the screen are the OSD operational buttons. In normal operation these just show as little white circles, but when you press them, the labels light up in a nice blue colour as shown above. This then tells you what each button does. These stay on for a few seconds before going out if It is a little odd though that you have to press one button to bring up the labels in the first place, but that first press still carries out its function as well. When I first set up the screen I found myself choosing the 'wrong' button to bring up the labels, and accidentally changed the input source! A minor design flaw I suppose, would have been good if they were motion or proximity sensitive and lit up when you got near like they do on the Dell U2711 / U2410 for instance. The buttons give you quick access to preset modes, contrast, full menu, brightness and input source. The power button glows a very subtle blue during normal operation. 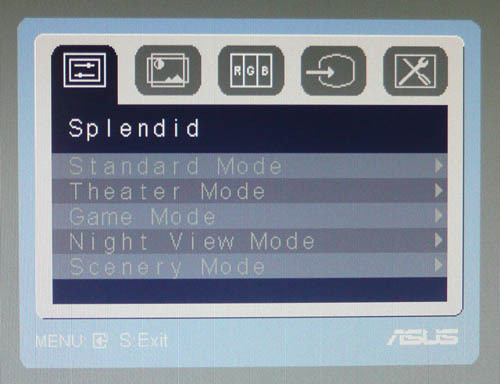 Above: OSD menu showing preset modes. Asus's website states that "The exclusive 'Splendid Video Intelligence Technology' optimizes video performance and image fidelity by enhancing color, brightness, contrast, and sharpness. 5 preset video modes (Scenery, Theater, Game, Night View, and Standard) can be selected via a hotkey." These preset modes were accessible with 1 button access via the left most OSD button which was labelled as "S/A". Pressing the button cycles through the modes quickly, or you can also access them via the normal full OSD menu. The OSD menu also has access to other options such as Colour Temperature, with a range of presets available here as well, including a 'user mode' offering individual RGB control. We will look at these modes and their performance in more detail in the colour accuracy section of the review. There is also access to the dynamic contrast ratio option (ASCR) and the 'Trace Free' feature for supposedly reducing motion blur. More on those later as well. I found the OSD to be fairly easy to use, although I found myself constantly choosing the wrong direction arrow to cycle from left to right in the menu! It's not as intuitive as some other OSD's I've seen before and a little bit fiddly to use. There's a decent enough range of options to choose from at least. The back of the screen shows the connections for the power cable and video interfaces. 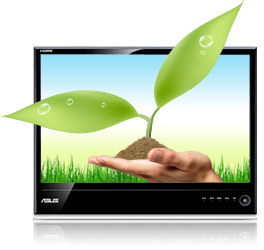 The screen needs an external power brick to operate as it is not built into the screen. As such, you need to use the provided power pack and cable to connect the screen. There is a single HDMI (HDCP supported) and D-sub interface, along with a headphone socket for sound passed through via HDMI. It would have been nice to feature a DVI interface as well I think, since you are going to use up the HDMI connection straight away from your PC most likely, leaving you no popular connection types for external equipment. The screen is packaged with a VGA and DVI > HDMI cable. The Asus MS246H utilises a 6-bit TN Film panel, utilising Frame Rate Control (FRC) to offer a colour palette of 16.7 million colours. The screen uses standard CCFL backlighting and so it's colour gamut covers 72% of the NTSC colour space, pretty much equivalent to the sRGB reference gamut. An important thing to consider for most users is how a screen will perform out of the box and with some basic manual adjustments. Since most users won't have access to hardware colorimeter tools, it is important to understand how the screen is going to perform in terms of colour accuracy for the average user. I restored my graphics card to default settings and set it to its standard profile. The MS246H was tested at default factory settings out of the box using the LaCie Blue Eye Pro and their accompanying software suite. The default factory results of the MS246H were actually very pleasing, especially when you consider this is a TN Film panel. Starting on the left, the CIE diagram shows the monitors colour gamut (black triangle) against the reference sRGB space (orange triangle). This gives confirmation that the screen is using standard CCFL backlighting as opposed to any extended gamut options. The colour space produced closely matches the sRGB reference, although does extend a little wider in red shades and doesn't quite cover the green shades fully. Nevertheless, this is a pretty standard result for a 72% NTSC screen, and those looking for a standard gamut screen will be pleased with this coverage. If you want to work with extended colour spaces though, you will need to look elsewhere as this is the limit of the backlighting unit used. Gamma of the screen was recorded at 2.1, and was only 5% deviation from the target of 2.2 which is the default for computer monitors. Colour temperature was also reasonably close in this default 'standard' preset mode to the target of 6500k (the temperature of daylight), being recorded at 5583k. Despite the brightness control being set at 100% by default, the luminance of the screen reached only 168 cd/m2. This can be seen in two ways. At default factory settings it means the screen is not overly bright compared with some other models which can range anywhere up to 500 cd/m2 in some cases. The target luminance we are aiming for from a desktop LCD screen in normal lighting conditions is 120 cd/m2, so this is not far from that target. You would not need to tone the brightness control down too much to reach this setting if that is what you wanted. This also means that lowering the brightness control can afford you a very low luminance should you wish, something which we will test in the contrast stability section shortly. However, on the flip side you have to consider that this is about the maximum luminance you could get from the screen so if you were wanting to use anything higher such as 200 cd/m2 you would not be able to reach it. Asus only rate the screen as having a maximum luminance of 250 cd/m2, but in practice it seems ~170 cd/m2 is the limit. This is probably relating to energy saving measures and eco-efficient backlighting, but may be an issue to some users who need a brighter screen. I did find even at this rather limited luminance, the screen was uncomfortable for prolonged use, and it seemed to wash out the colours a little as well. I'd want to turn it down as part of the calibration process for sure. At default settings and 168 cd/m2 luminance the MS246H returned a very decent 0.18 cd/m2 black depth, and a usable static contrast ratio of 933:1. This was very good, and one of the best results you will see from modern screens. Another testiment to the improvements which have been made in TN Film technology over the last year or two. Default colour accuracy was pretty good in these tests and with an average dE of only 2.6 it was better than many high end competing 24" models (more on this in a bit). Maximum dE was only 4.6 and colours were fairly even across the range. This was a good default result, and I'm sure some calibration could improve things even further. I tested the screen at default settings, but changing the colour temperature setting to see if any of them helped bring us nearer to our target values. 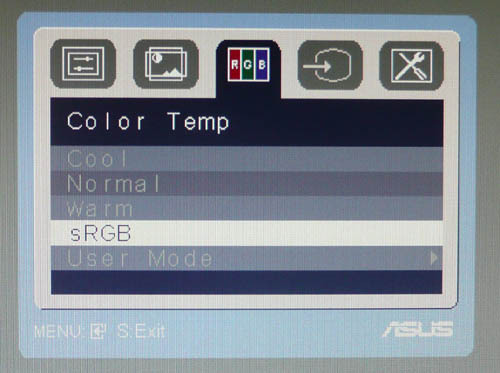 These modes do not give you access to user defined RGB values, but instead operate as a preset colour temperature mode which the manufacturer has specified. The 'normal' colour temp mode brought us slightly nearer to the target of 6500k but was a little warmer at 7073k (9% deviation). Luminance was also lowered by about 35 cd/m2 in this mode it seemed. The 'sRGB' preset colour temp was also a little closer to the 6500k than the 'user mode', but was on the cooler side at 5808k (11% deviation). Colour accuracy and gamma remained very similar to the default settings. These modes don't get you much closer to the 6500k colour temperature but you can at least make the image a little warmer than the default 'user mode' if you prefer by using the 'normal' colour temp preset. I carried out the calibration process using LaCie's Blue Eye Pro software and colorimeter. Settings were changed in the OSD as shown above, and the automated stage carried out further corrections at a graphics card LUT level, creating and saving an ICC profile. If you want to try our settings and ICC profile on your MS246H, you can find them in our ICC profile database. I calibrated the screen again in both the 'normal' and 'sRGB' colour temp modes. The 'normal' mode did not alow us to get any more accurate colours than the 'user mode' we had tried above. dE average still remained around 1.0 at best, ranging up to >2.5 maximum. However, in the sRGB colour temp mode, we were able to get much better accuracy with the calibration process. In this mode, we also managed to get <0.5% deviation from our target colour temperature of 6500k, now being recorded at 6507k. Best of all, dE average was now down to a very decent 0.4, and dE maximum was now down from 2.7 to 1.0. LaCie would consider colour fidelity here to be excellent. It was pleasing to see we could acheive better results thanks to this preset mode. I'd suggest using this mode as a starting point for any calibration you might carry out. Again, if you want it, our ICC profile is available. Testing the screen with gradients showed no sign of banding and smooth transitions across the range. The Frame Rate Control (FRC) mechanism was detectable if you looked closely, and characterised by a 'twinkling' of the colours in darker shades. In day to day use, this was not noticeable, but a limitation of using a 6-bit +FRC panel. I plotted the results of the Asus MS246H against some of the other models in this kind of size range we have tested. 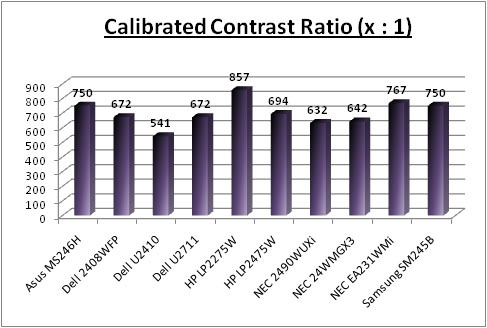 As you can see, the default average dE reflecting colour accuracy was one of the best of these models, beating high end models from Dell (U2410 and U2711) and HP (LP2475W) for instance. This was a great result from a TN Film panel as well, and similar to the suprisingly good performance we saw from the Samsung SM245B when we tested it - also TN Film based. 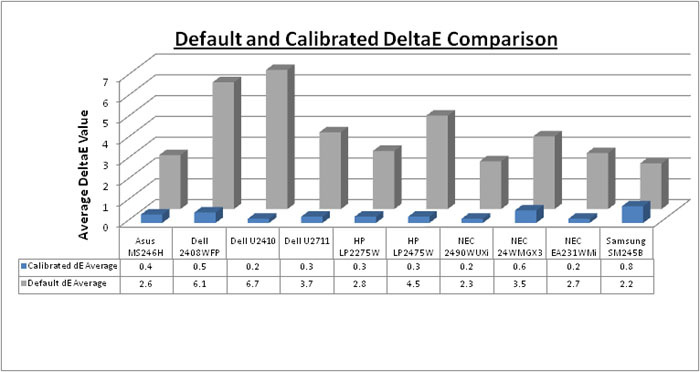 Default accuracy does seem to be better on models where standard gamut backlighting is used with models like the NEC EA231WMi and these TN Film offerings offering comparable default performance (average dE of around 2.6 - 2.8). 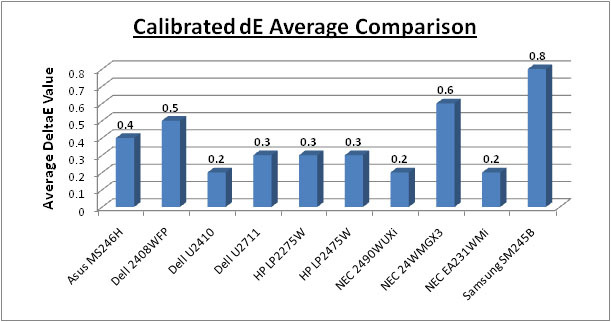 Once calibrated the Asus MS246H was better (dE average 0.4), although not quite as good as some of our other models. The Dell U2410 (0.2), NEC EA231WMi (0.2) and HP LP2475W (0.3) with their IPS panels offered slightly better performance overall in terms of colour accuracy, but the TN Film panel of the MS246H has made some improvements since the early 24" TN Film panels in the market (Samsung SM245B - dE average 0.8). 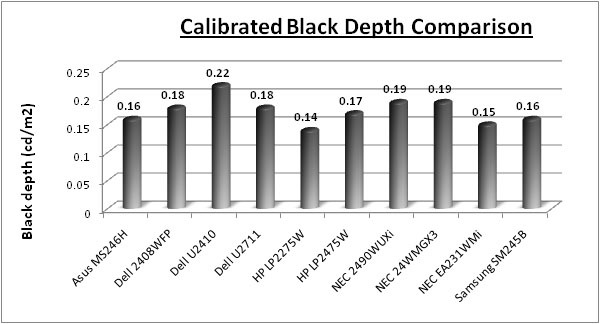 Calibrated black depth of the Asus (0.16) was very good, and one of the best we have recorded within this size range. It matched the performance of the Samsung SM245B and was a deeper black than the Dell U2410 (0.22) and even the S-PVA based Dell 2408WFP before it (0.18). At 0.16 cd/m2 it was slightly behind the 22" HP LP2275W which uses an S-PVA panel (0.14 cd/m2) and the IPS based NEC EA231WMi (0.15 cd/m2). Still, a very decent performance in this regard from the Asus model and from TN Film technology. Calibrated contrast ratio was very good as well at 750:1, being only behind the HP LP2275W (857:1) and the NEC EA231WMi (767:1). The results of this test were pretty pleasing. Contrast was fairly stable across the full range of OSD adjustments, typcally staying ar around 920:1. Luminance reached a maximum of only 171 cd/m2 though, something we have already discussed and a fair way off the specified maximum brightness of 250 cd/m2. It did allow you to lower the luminance down to as low as 42 cd/m2 though with simple OSD adjustments. 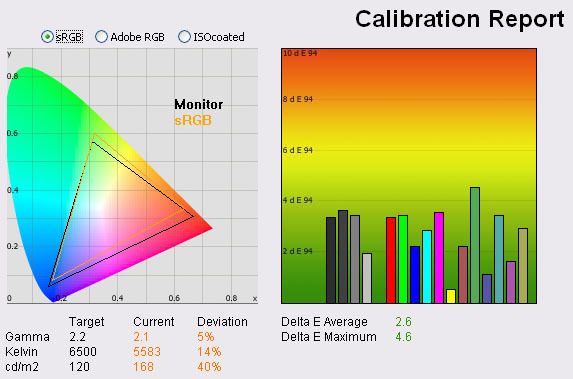 If you are not carrying out any calibration, you might want to consider dropping the OSD brightness control down to about 65% to achieve a more comfortable luminance of around 120 cd/m2. Black depth was reduced nicely as you lowered the brightness control, ranging from an impressive 0.19 cd/m2 at the top end, down to an excellent 0.04 cd/m2 at 0% brightness. This actually gave us the highest contrast ratio as well of 1047:1 but is probably too dark for most users. 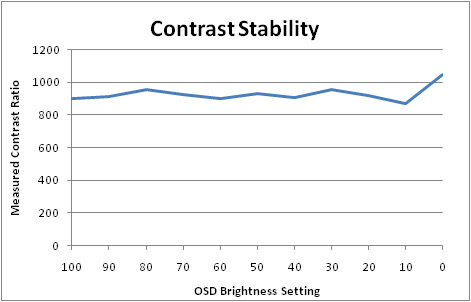 The results of this test were plotted on the above graph as well showing the recorded static contrast ratio vs. OSD brightness adjustment. The MS246H includes Asus' own ASCR technology. According to Asus' website "ASCR (ASUS Smart Contrast Ratio) Technology enhances the display’s dynamic contrast ratio, which adjusts the brightness according to the content so that the picture to be displayed in better dark level and vivider color, creating sharper and brighter images, especially during video and movie playback." Unless I was doing something drastically wrong, I could not get this ASCR feature do really do anything! You could enable the option when using any of the preset modes other than the 'standard mode'. If ASCR was enabled, you could no longer change the brightness via the OSD - it would let you change the setting, but it did nothing. The brightness is supposed to change depending on the content shown on the screen, but it seemed to make no difference in pratice and brightness just stayed as it was. Not sure whether this feature is just broken or just pretty useless?! Viewing angles of the Asus MS246H were somewhat restrictive, something you should expect from a TN Film panel really. Horizontally, the viewing angles were not too bad, with a contrast shift only really becoming a significant problem from a wide angle. Vertically the limitations of TN Film were evident. From above a central field of view, the contrast change left the image brighter and more washed out. From even a small angle below, the screen began to show the characteristic darkening of TN Film panels. If you want wider viewing angles you will need to consider VA or IPS based screens. For a single viewer, these viewing angles from the MS246H are probably not going to present any major problem, unless you are hoping to watch a lot of videos on the screen or from a position anything other than directly in front of the panel. Uniformity of the Asus MS246H was not too bad, but there were some noticeable differences in some areas of the screen. Viewing an all light-grey background allowed you to spot some slightly darker regions along the top edge and in the bottom right hand area (where the spike shows on the above). It seemed the left hand edge was darker than the majority of the screen a deviance of between 8 - 18% along the left hand edge. In fact the maximum deviance was ~18% where luminance dropped down to around 102 cd/m2. In day to day use you would be hard pressed to spot this. There was no sign of any colour 'tinting' or change in colour tone on this panel. As usual we also tested the screen with an all black image and in a darkened room. A camera was used to capture the result. There was a few areas of uneveness noticeable to the naked eye, and these were picked up by our camera too. There was some very slight leakage along each edge of the screen, although this was minimal. The only really noticeable area of leakage was in the bottom right hand corner, which you can see clearly (albeit a little exagerated) in the above image. Overall though, uniformity was not too bad. Despite being only a TN Film panel, you should not discount the Asus MS246H for office work. TN Film can be perfectly adequate for these type of uses, and the MS246H is no exception. The 1920 x 1080 resolution and 0.272mm pixel pitch gives a decent area in which to work and a comfortable text size for long periods of work. The luminance of the screen is sensible, even if at 100% brightness and so you can easily find a comfortable backlight level for your working conditions and if you need to do a lot of office work. I would recommend turning the brightness down to about 60 - 65% to reach a level of about 120 cd/m2. There are a series of preset modes but none specific to 'text' or 'internet'. The 'night view mode' is the closest and seems to make the image slightly more yellow/green and a little darker. Might be useful to some users depending on how they set up the standard mode. The viewing angles of the screen are pretty limited due to the panel technology, although for office work this is not really any problem since you can view the screen head on easily enough. If you were doing any colour critical work or editing photos for example, the viewing angles could present a problem since colour and contrast can shift with even slight realignment of your field of view. D-sub gives a reasonably good picture quality and a sharp image, but it is slightly better when using the digital HDMI interface. The Asus MS246H was tested using the chase test in PixPerAn, a good bit of software for trying to quantify differences in real terms responsiveness between monitors. As a reminder, a series of pictures are taken on the highest shutter speed and compared. The images below show the best case example on the left hand side, and the worst case example on the right hand side. This should only be used as a rough guide to comparative responsiveness but is handy as a way of keeping a constant test of each screen. 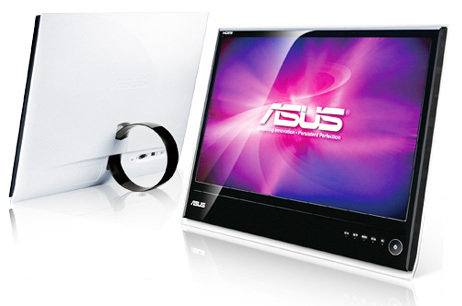 The Asus MS246H features a 2ms G2G rated TN Film panel, with an ISO (black > white) response time of 5ms. The panel uses Response Time Compensation (RTC) to boost pixel response times across grey transitions and at a rating of 2ms, it currently as low as these panels go in the market - on paper at least. Testing the screen using the PixPerAn software and in real life application yielded some pleasing results. Responsiveness was very good and there was no noticeable ghosting of the image behind the moving car. There was some slight motion blur as you would expect, but it was a little smoother than the other 24" models we have shown above. It was a little faster than the Dell U2410 and HP LP2475W in this test, and was also free from any dark overshoot artefacts as can be seen on the LP2475W for instance. As a comparison I've also included the results from our test of the Samsung SM2233RZ, our current gaming champion thanks to its very low response time and 120Hz technology. The Asus MS246H offers a very good pixel responsiveness but does show some slight overshoot or the RTC impulse. Motion blur is also more apparent in practice and images are not as smooth. This is because the MS246H is a 60Hz panel, whereas the Samsung features true 120Hz technology for improved frame rates. An interesting feature is available within the OSD menu as well. Asus provide access to a 'Trace Free' option. Based on the name it wasn't immediately obvious what this feature would do, but Asus kindly explain on their website: "With the growing popularity of watching videos and playing games on computers, having a quick response time has become a basic requirement of LCD monitors. 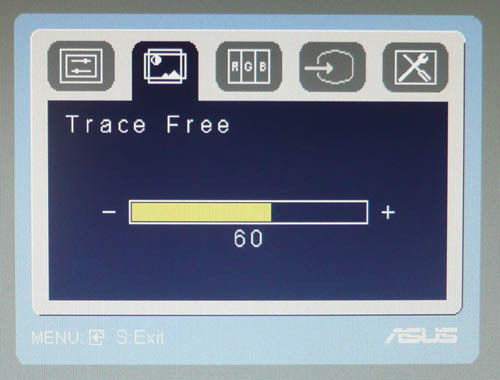 Trace Free Technology reduces the response time of ASUS monitors, eliminating ghosting and tracers during video playback. It does this by controlling voltage levels when driving liquid crystals, resulting in response times from 5 ms (on/off) to 2 ms (gray-to-gray), and therefore ensuring fluid and clear video playback." The Trace Free option can be altered between 0 and 100, in steps of 20. Above shows the results in the PixPerAn tests at each stage, and I'm pleased to say that the feature did work well. At a setting of 0, RTC impulse was turned down considerably, and perhaps even turned off. A noticeable trailing ghost image was visible behind the moving car and was characteristic of a non-overdriven 5ms TN Film panel. As you turned this feature up, the ghost image began to fade and by the time you reached a setting of 60 (the default of the screen in fact) it was very hard to detect by the naked eye. There was some blurring evident and you could make out a slight red trail associated with the colour of the moving car. Turning Trace Free up to 80 gave the best result in my opinion. The blurring was reduced almost completely and this gave us a very smooth moving image and one of the most responsive panels we have tested. Turning this setting up to 100 ramped the RTC impulse up to full, but sadly did introduce some slight overdrive trailing in the form of a white halo behind the moving car. This is related to an overshoot of the RTC impulse, producing a similar artefact to the dark trailing you can see from our HP LP2475W results. I think the 100 setting was a little too aggressive and 80 would be the most suitable setting for gaming and fast moving images. Once you've settled on your preferred level, you'd never really have the need to change this again, so in that sense it's a bit of an odd setting to include. From a reviewers point of view, and for those who enjoy investigating these type of things, it was a good feature to have and interesting to observe the differences. The MS246H also features hardware level aspect ratio control, giving options for 'full', '4:3' and 'overscan'. The input lag of the Asus MS246H was very low! The lag was typically 0 - 10ms, with the occasional delay up to 20ms in rare cases. 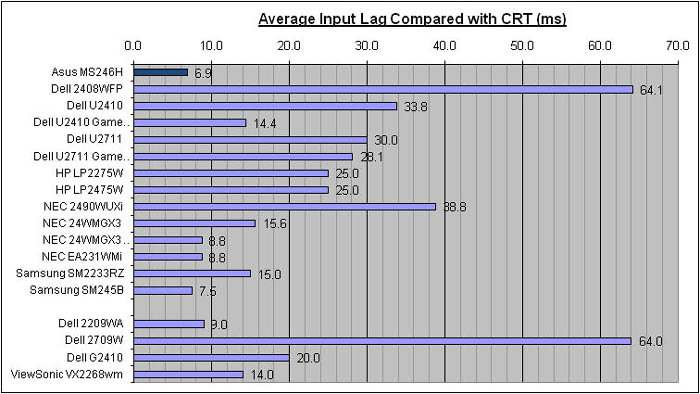 Average input lag was recorderd at a very impressive 6.9ms, making this the lowest we have seen from competing models to date. It was slight faster than the Samsung SM245B (7.5ms) which is also a 24" TN Film based model, and significanly faster than some other models such as the HP LP2475W (25ms) and the Dell 2408WFP (64.1ms). The MS246H should present no problems in this regard, even to the particularly fussy. Dynamic contrast ratio available but seemingly does not function correctly at all?! 1) The aesthetics and features of the screen. It's a unique design and may not be to everyones taste, but I personally found it sleek and attractive and a well designed piece of kit. Yes there are limitations in terms of ergonomics and interfaces, but this is why you need to think about it up front. Just make sure you do not need useful things like height adjustment, extra HDMI ports or a dedicated DVI connection. If you can survive without them, why pay more for a screen which has them? 2) The fact that this is a TN Film based model. This technology carries its own limitations, but to be honest the only real complaints I would have about this particular model would be the restrictive viewing angles. Colour accuracy was very good, even at default settings and without calibration. Black depth, contrast ratio and picture quality were all very good as well, and responsiveness and input lag were excellent. A good option for a gaming screen here. If you take these two things into consideration you should be fine. Although there are some limitations in terms of features, design and panel technology that does of course mean that the price is very competitive! At the time of writing, the MS246H retails for ~£220 GBP. 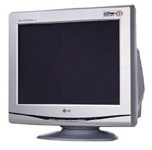 The NEC EA231WMi with it's IPS panel retails for around £280 and although it uses IPS technology does have some limitations of its own (limited interfaces, panel uniformity problems, moderate responsiveness). I would place the NEC as one of the main competitors to the MS246H as it is at least within a sensible price difference. Other popular models in this range like the Dell U2410 and HP LP2475W are far more expensive than this Asus model, retailing for around £450. They do offer some excellent performance all round, and have a much wider range of features and options as well. However, the price differential is significant. If you're looking for a lower cost screen, this is a great option I think. Well priced, an unusual and attractive design which is sure to go well in any home office, and a decent performance in most areas as well.